I was asked to provide readings for Education Northwest’s book club this month, and to moderate a discussion. The whole process was fun, interesting and revealing. I thought I’d share our reading list here, along with my notes of talking points on each. 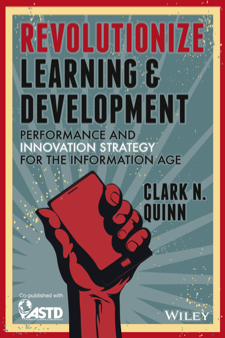 Clark Quinn: Revolutionize Learning & Development: Performance and Innovation Strategy for the Information Age, chapters 5 (“Our Organizations”) and 6 (“Our Technology”). If incremental changes impact societal development, learning drives the increments. How do we promote learning in our society? NOT scholastic learning, or formal learning, but culturally adaptive and learning. Intellectual property can block societal learning because it prevents the free flow of information. Innovation is reduced. Owning vs. Sharing economy. Impeding learning can lead to lower standards of living. Premise: Organizations need to be constantly adaptive – never in state but constantly changing, growing. Clark Quinn’s great new book. People need the power to pursue their hunches, expand their roles, self-improve: Remove structural barriers. Social networks to collaborate, cooperate and both –> coherent organization. Traditional organizations have hierarchical information & HR structures which are barriers to being a learning organization. Technology is evolving through use, not through technological innovation itself. Structural impediments to learning must be removed. Interesting tension: Global, connected, mobile vs. local, personal, contractual. The only knowledge we can truly manage is my own. How do I feed my knowledge to the organization? And how does the organization nourish me? We are terrible at telling people what we know: Hard to articulate, quantify. Some hoard knowledge because it is the only thing they own: Afraid for their jobs, other’s judgments, lack of professional freedom. Share is the new save! Work out loud. Social learning needs facilitation, and framework. There are different types of social learning and each needs a slightly different type of hands-on experience. ← Learning Is Our Job… it’s not just me (or us).